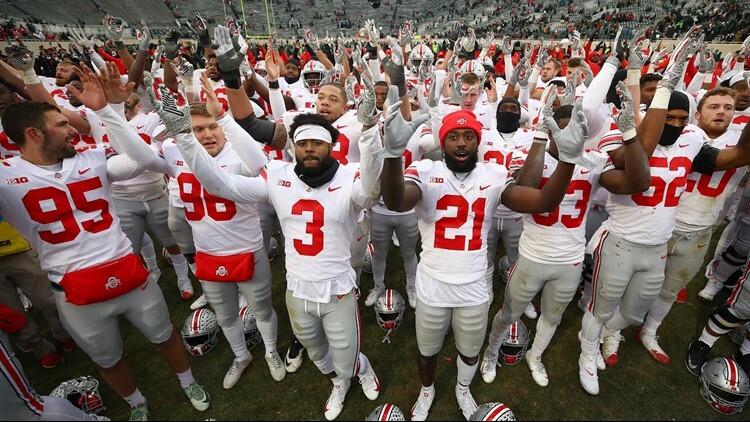 The Ohio State Buckeyes celebrate a 26-6 win over the Michigan State Spartans at Spartan Stadium on November 10, 2018 in East Lansing, Michigan. In a tight defensive struggle, the Buckeyes enjoyed a huge advantage in field position during the second half. EAST LANSING, Mich. (AP) - Drue Chrisman kept Michigan State pinned back with a sensational second half of punting, and eighth-ranked Ohio State eventually pulled away for a 26-6 victory over the 24th-ranked Spartans on Saturday.